This epsiode is a historical mission based on the early 1940 campain of 2nd Batallion of East Yorshire that was involve in several operation between North-West of France and Belgium. This is a quite neat and nearly perfect transcription of what really happens during 1 month of the 'Blitzkrieg' place visited are Dendermonde, Warcoing, Roubaix, Noordzee, Yser River. All maps are introduced by a screen telling you a brief story like a diary of what happens it's really a great historical work. Design start slowly with a kind of simple map with good use of scripting but quite average design (When i tried first this episode more than one year ago and didn't know how to have the objective explained on screen -here-, I was blocked on the blowing bridge because I didn't know what to do...and also didn't find the mapping from great quality). Hopefully after the first mission Design is increasing a lot. Building of areas were well manage and quite realistic in an kind of isolated village typical from the flamish belgium region all other maps after the first one are enjoyable through their playability and travelling. There are several thinks that bother me and especially the roads that look not realistic but in a general approach it's still above average. 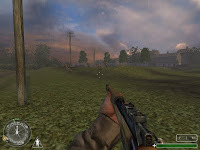 Gameplay is well plesant and is mostly a mix of attack, progress, retreat mission that will make you with your squad progress through maps that varied also through their 'time through the day' happenings. Its well scripted all over the entire episode and doesn't provide any impossible spots. In conclusion: This was the first release by Steve that lurned everything from zero to make this entire episode. He also manage to have a really important historical database to build something coherant and enjoyable through a quite important and perhaps sad part of WWII during the retreat of thousand of English soldiers that where blocked on the sea side attempting to return to England. Another must have campaign but one of the best sp creator of WWII experience.